If you love Apple, then you definitely need to add these to your blogroll. 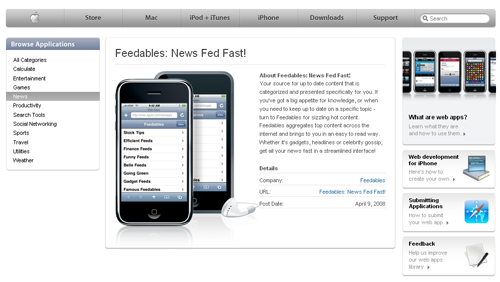 Here are 12 feeds we at Feedables think is worth noting. There is no data to support our finding… other than we find them interesting and have added them to ours. Digg / Apple – This is by far the most interesting site for Apple news. Digg will display the most popular Apple news pulled from around the Internet. 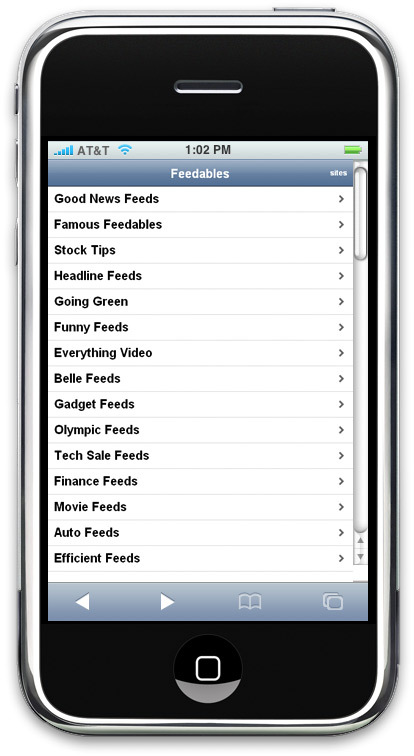 If you’re only adding a single feed, pick this one. Lifehacker Mac OS X – Lifehacker has many available feeds for Apple fans. Mac OS X is the most interesting but you should also check out Mac and Mac Tips. Apple Insider – One of our favorite rumor website for Apple. They give the ability to allow users to post information for Apple news anonymously. Heck, anyone who is named in a suite against them by Apple, Inc must be good. Ask MetaFilter Apple News – If you’re a MeFi then you’ll definitely appreciate this one. Want to see Apple questions from one the most popular forums in the web? Then this will definitely scratch that itch. TUAW – Or The Unofficial Apple Weblog is another great stop for all your Apple News. They are part of the Weblogs, Inc family who are owned by AOL. They have great list of sites for just about any type of content you’re looking for. Gizmodo Apple News – Gizmodo is definitely one we couldn’t leave out. They’re known as the gadget guide and we love all the Apple gadgets! Think Secret – Think Secret is a great resource for only Apple inside news, because let’s face it… we can never have enough inside news. We also heard they also were sued. Macrumors -is “Apple Mac Rumors and News You Care About” if you care about Apple… which we do. Apple Hot News – No explanation needed, we have to have this one. Valleywag Apple News – Not the first place we thought to look for Apple news but definitely worth checking out. OS Feeds Apple News – I know we said Top 12 but this is more of a honorary mention :). If you like the list above and don’t want to add all of them to your feed reader then make sure to check this single page aggregator for Apple news. This is by no means a definite list, just one we thought was worth sharing. We hoped you liked it. If there are others you feel are worth mentioning make sure to leave a comment.